What can you expect from our International University Fairs? \r\n\r\nOur International University Fairs are a great opportunity to meet with university representatives face to face and ask any questions you may have.\r\n\r\nSome of our students find the fairs particularly useful as they may never have visited some of their chosen universities. 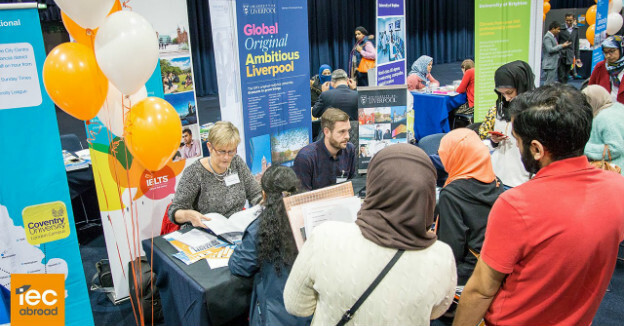 When you’re based in Manchester it can be difficult to visit universities located at the other end of the country!\r\n\r\nThe fairs are attended by numerous universities and each institution has their own stand. Each university usually has two representatives and they will be more than happy to talk you through everything you wish to know. While more specific questions about fees or accommodation booking may need to be answered by a certain member of staff, the university representatives will be able to advise you on everything from entry grades to the culture of the university.\r\n\r\nWe regularly participate in university fairs and our students can keep up to date by following us on Twitter and Facebook. We’re also inclined to remind our students, so it’s difficult to miss a university fair!\r\n\r\nIf you’ve not yet subscribed to the IEC Abroad YouTube channel, please check us out and watch some of our university fair videos to see how they can benefit you. « What is UCAS and how does it affect me?